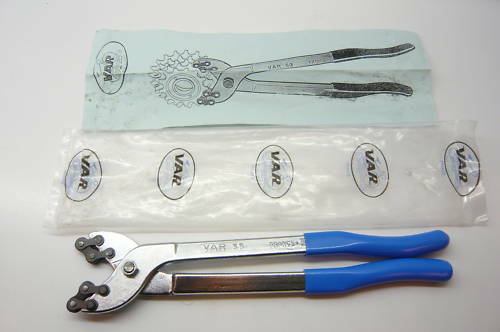 From the VAR catalog: The cog remover enables the small sprocket of a freewheel block to be removed effortlessly. One jaw of the tool locks on to the second sprocket . The other on to the one to be removed and when the handles are squeezed together, this is unscrewed. It is welcomed by repairers and team mechanics. Very handy in place of the chain-type sprocket remover. BTW: This tool works great on the mid 1980`s Shimano cassette hubs where the bottom sprocket threads on to retain the stack.